The penny appears to be a small and insignificant coin. Many kids may believe that they too, like the penny, are insignificant, but that couldn’t be further from the truth. In fact, they are the future of our great nation. 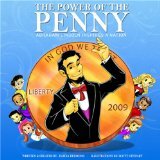 The Power of the Penny provides information about Abraham Lincoln, and all the values he modeled. Known for courage, persistence, honesty, kindness, speaking well, and writing clearly, he is an inspiration for others. The penny also provides clues to the values of life, liberty and the pursuit of happiness for everyone. Kids are encouraged through activities to discover their unique abilities and passions, and to model the excellence of Abraham Lincoln in their own lives. The book’s website provides information for hosting Penny Parties and other penny activities to get kids more involved in bettering themselves and their communities. The Power of the Penny has received the Mom’s Choice Award honoring excellence. If every child read this book, and put into practice the ideas it suggests, the future of our country would be in great hands.